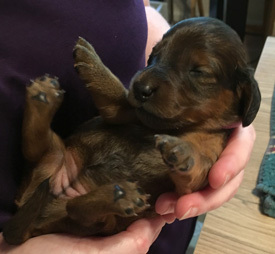 Our first litter was born in the summer of 2018. 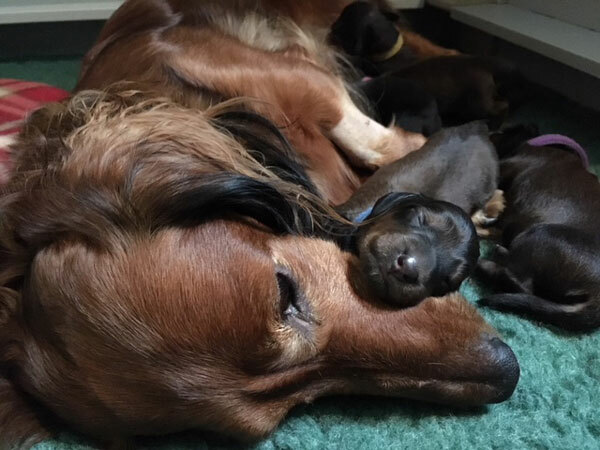 The mother is Bossa and the father is Teo, a standard longhair dachshund from Denmark, now living in Ohio. The whelping was an adventure. 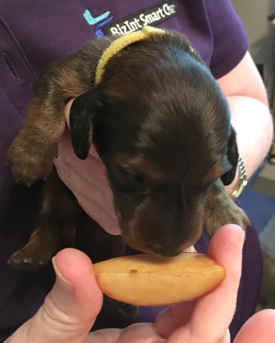 Bossa was in labor for about 36 hours, made several visits to the emergency vet, and finally delivered the first pup in the early morning of 18 August, minutes before being scheduled for a (thankfully unnecessary) c-section. 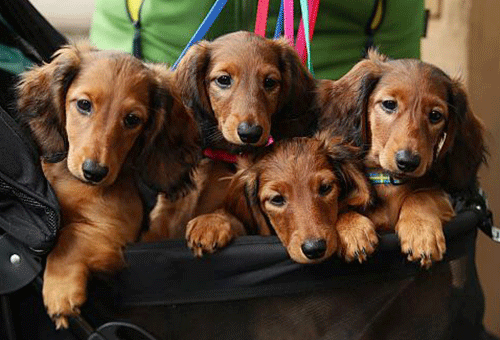 We refer to the litter as "The Vikings." Bossa was born in the old Viking town of Visby on the Swedish island of Gotland. Teo was born near the old Viking town of Aarhus in Denmark. 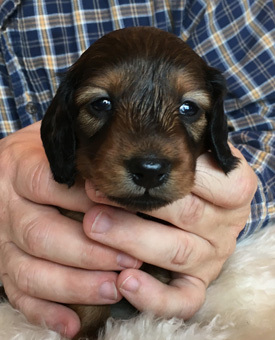 In the hours before the first puppy was finally born, we received an email from Patt Nance saying "Come on, you little Scandinavians. Come out of there fighting like Vikings." And they did! 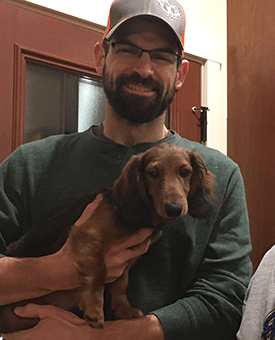 On 9 December, we said goodbye to Erik (renamed "Arrow" by his new family), who left with his new owner to go live in Ohio with Jake and Mary and their 4 children. 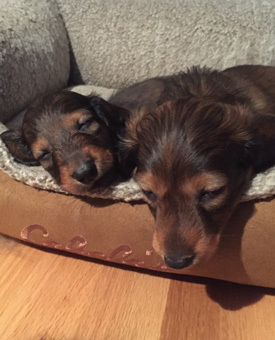 With Erik's departure, we transitioned from raising a litter to raising our two new puppies, Vinca and Vasa. 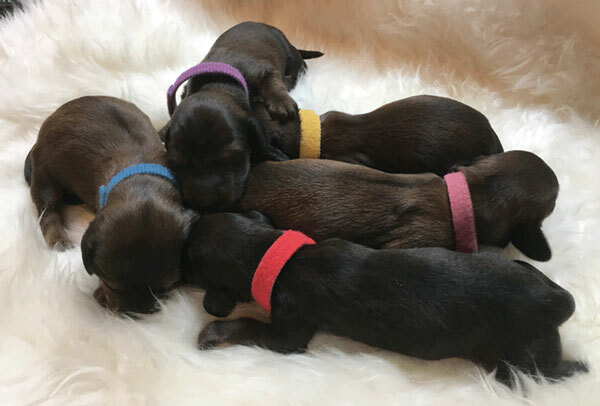 It's been an amazing experience raising the Viking puppies. 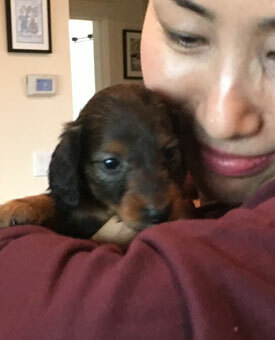 To quote from "Going Home," the last chapter of Puppy Culture: "Watch people's lives change before your eyes when you place a puppy in their arms, and know that you're part of a bigger purpose...Hug your puppies goodbye with a tear in your eye and tell them to go out and change the world. And they will." Erik and Jake say goodbye on 9 December before heading to airport. 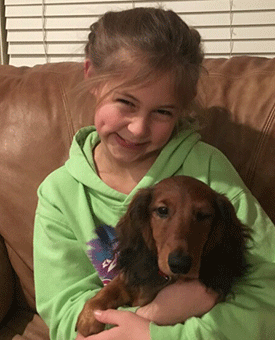 Erik was renamed "Arrow" by his new family, including Alice, a standard poodle. 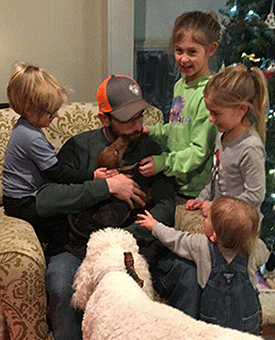 Jake did not tell the children that he was bringing home a puppy, so it was a surprise! Vali and his playmate Baby. 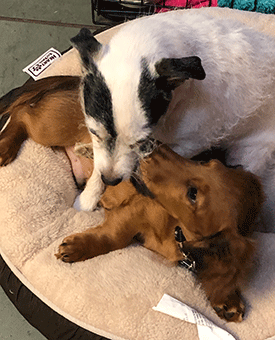 Vali is taking a "Focus Games" online class with Vinca for the next 6 weeks, so we get to watch him learning to work with Sydney. Michelle and Oskar at 16 weeks. We got to see Oskar when Michelle and Chris came to watch Bossa at an agility trial. 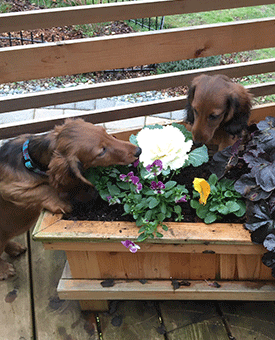 Vinca and Erik check out the new plants in the deck planter. 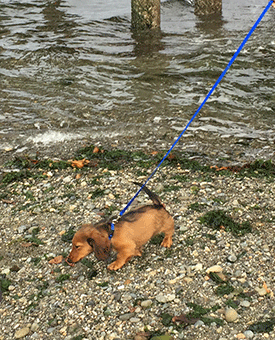 At 14 weeks, Vinca and Erik went to the vet for shots, and both weighed 8.5 lbs (we think Vasa weighs about the same). 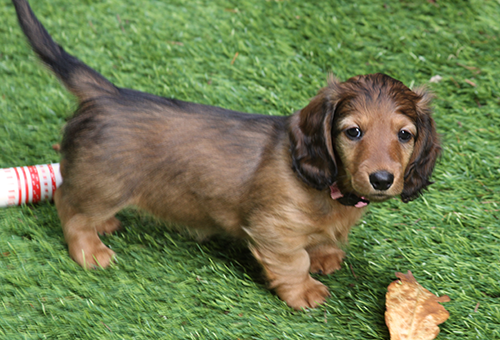 This is what Bossa weighed at 14 weeks, so we hope that they will also grow up to be about 15 lbs. 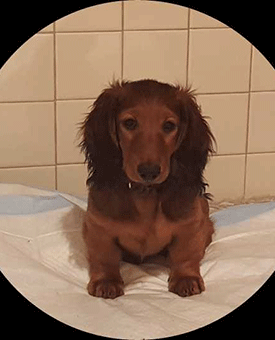 VIDEO: Here is Erik at Puppy Preschool class with Margaret on 20 November, doing a great job with new obstables and sitting while people walk by. It looks like Erik will go to live with a family in Ohio (near where his dad Teo lives!) on 9 December. Here's Vali with his new playmate Baby. 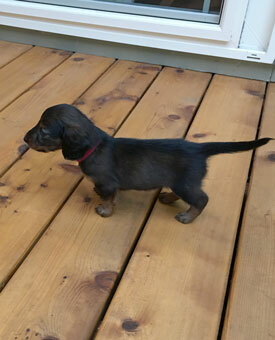 Here's Oskar at 14 weeks -- he weighs 10 lbs. Diane and John went on a business trip to Europe 6-17 November, with Bertha and Margaret doing a heroic job taking care of the Viking Three (Vinca, Vasa & Erik.) 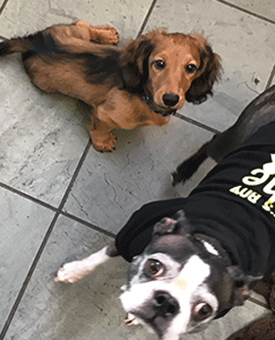 We're enjoying getting reports from Vali and Oskar's new owners! 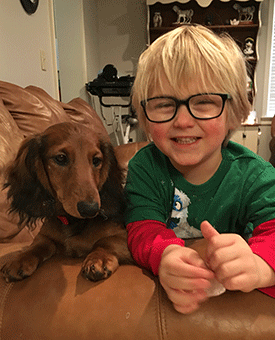 Here is video from St. Louis of Vali seeing his first snow and playing in even more snow! That is his new playmate Baby in the videos with him. 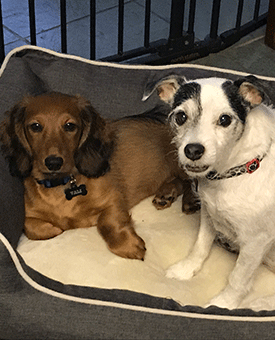 Vali in his new home with a visiting Boston Terrier. 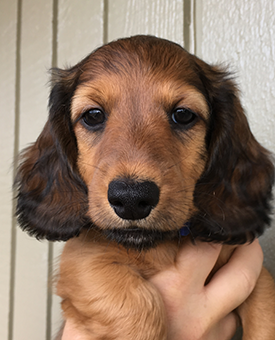 Erik at 13 weeks -- he is really growing up! Vali, Erik, Vinca and Vasa at an Argus Ranch agility trial on 3 November (Nina Sage Photography). 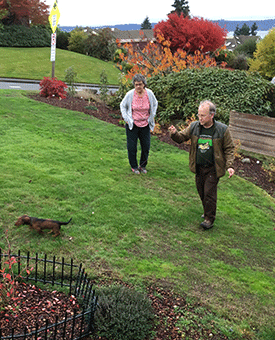 On 26 October, Oskar (formerly Purple male) went to his new home with Chris and Michelle, who live here in Federal Way, and started Puppy Preschool class with them. 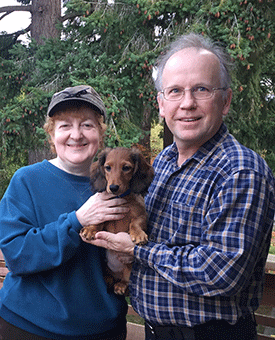 On 30 October, our friend and breeder mentor Patt Nance arrived from Ohio. 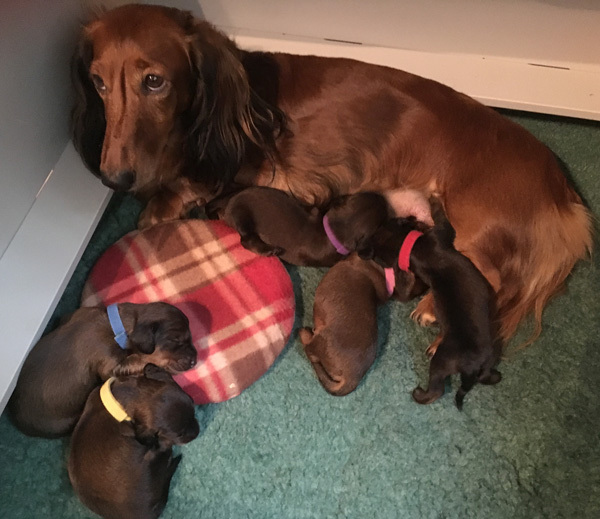 She started by retesting all the puppies and then did two days of tracking evaluation in our yard and at Saltwater State Park. Once again, Vinca was the star, followed closely by Vali, and then Vasa and Erik. 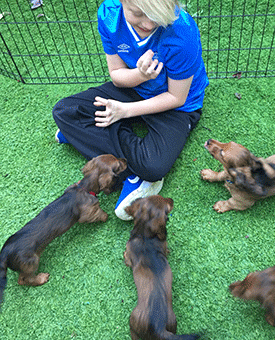 On 2 November, John's mother, sister Sydney and nephew Ian arrived from St. Louis to meet the puppies. They went to an agility trial with us on 3 November to watch Bossa earn double Q #16 towards her MACH2. 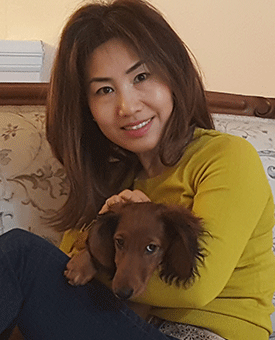 On 5 November, they returned home with Vali, who is now living with Sydney and Ian. Oskar with Michelle and Chris as we say goodbye and he goes to his new home. 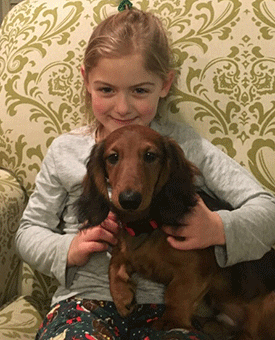 Michelle with Oskar at her salon. Patt watches John do a short track with one of the Vikings in our front yard. 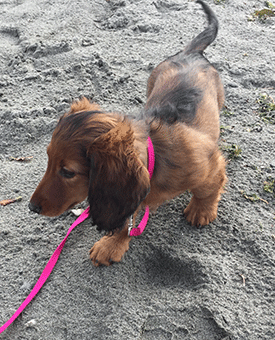 Vinca on her first trip to Redondo Beach. Sydney with Viking Valiant "Vali". 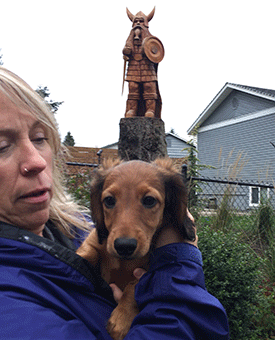 Yes, that is a Viking statue here in Federal Way. Vali taking a walk with the Willmores down at Redondo Beach. Ian fends off the Vikings in the courtyard. 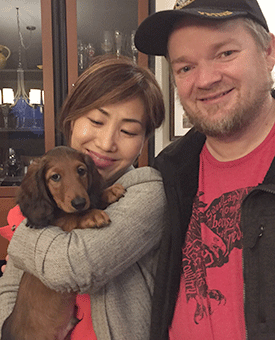 Diane and John say goodbye to Vali as he heads to his new home. 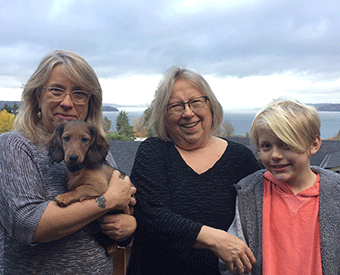 And here is Vali with Sydney, Carolyn and Ian on our deck before they head to airport to take Vali to his new home in St. Louis. 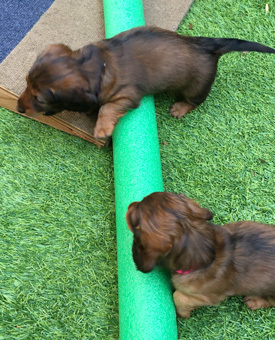 We have given the Viking puppies names and are starting to make decisions about their new homes. 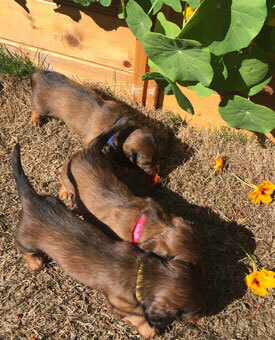 Vinca and Vasa are now eating separately from their littermates and we are working with all the Vikings on crate training, walking on leash, attention, sits & downs, and resource guarding. New! 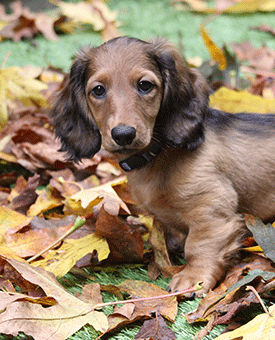 Six minutes of Viking video with the puppies getting their first experience to play in the fall leaves on 23 October. Vali (short for "Valiant", formerly Blue male) strikes a regal pose. 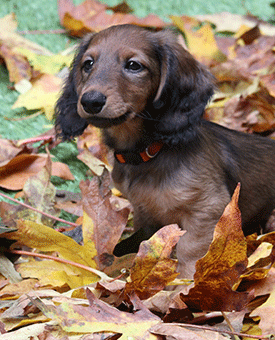 Vinca (formerly Pink female) takes a break from playing in the leaves. Erik (formerly Red male) sits still just long enough to get a photo. 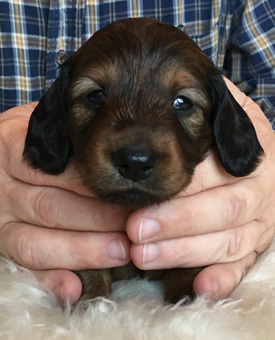 Oskar (formerly Purple male) is just a few days away from going to his new home. Vasa (formerly Yellow male) is wearing his new Swedish flag blue & yellow collar. 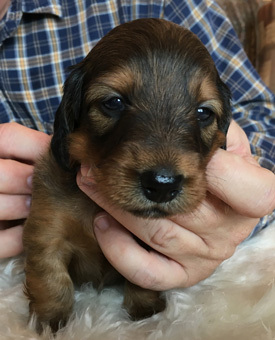 He has a "racing stripe" down his nose like his mother Bossa. 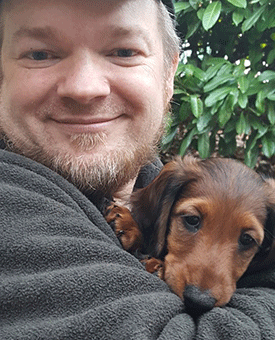 Finally, here is Oskar with his new owner Chris, on the day that he was selected to be their new puppy. It was a real challenge to get a photo of the Viking Five. 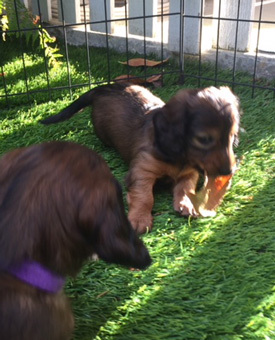 First we tried to tire them out playing in the leaves, then put them in a basket, put an x-pen around it, and waited for them to "mand" (sit for attention.) 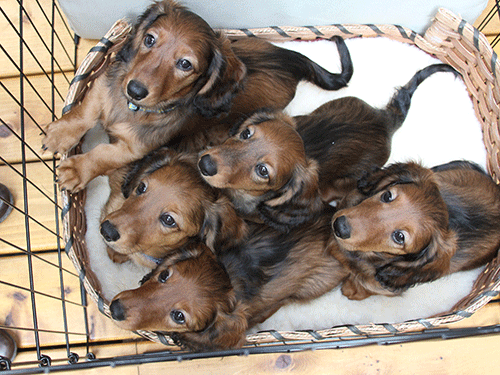 Left top to bottom is Vasa, Vali and Vinca, then Erik in the middle and Oskar to the right. Thank you to Margaret for all her help with the big photo day! Vali and Erik went with John to a dachshund field trial on 10/20, where they met lots of people and walked around on leash. They were a big hit! The Pink female is staying with us and her name will be Viking Spirit Vinca "Vinca". 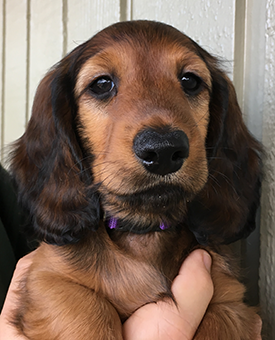 Vinca attended her first Puppy Kindergarten class on Thursday. At 8 weeks she weighed 5 1/2 lbs. 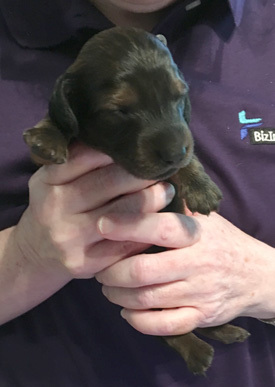 We are also keeping the Yellow male and he will be Viking Legend Vasa "Vasa" or "Vaz" for short. Vasa went to his first Puppy Kindergarten class on Sunday. At 8 weeks he weighed 5 lbs. 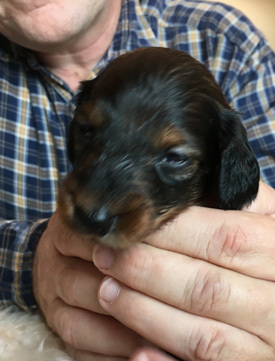 The Purple male has been chosen by a local couple and he will be Viking Via Oskarshamn "Oskar. 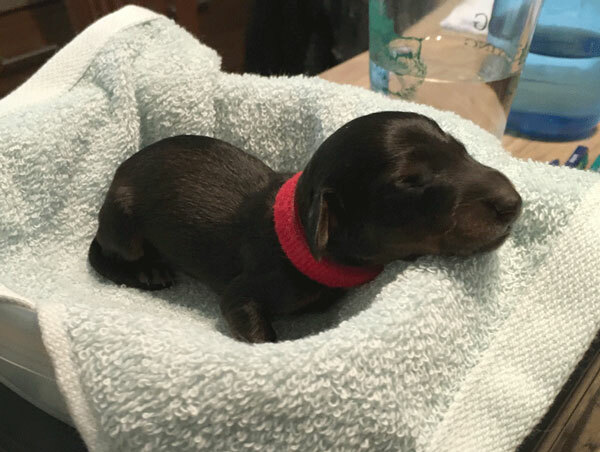 At 8 weeks he weighed 6 lbs. The Blue male is now Viking Valiant "Vali" -- a very nice all-around male, energetic, easy to train, with a solid temperament. At 8 weeks he weighed 5 3/4 lbs. Vali is going to live with John's sister and nephew in St. Louis. 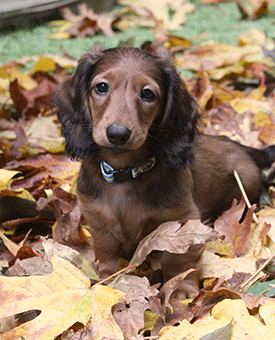 Here is video of Vali's first Puppy Track on 12 October. If you see a flag waving, that's to keep away bees! The little Red male is now Viking Explorer Erik the Red "Erik." 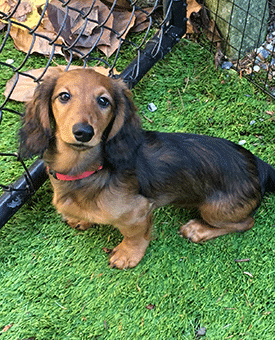 Erik is a very appealing and affectionate little boy who loves exploring new environments. At 8 weeks he weighed 4 1/2 lbs. 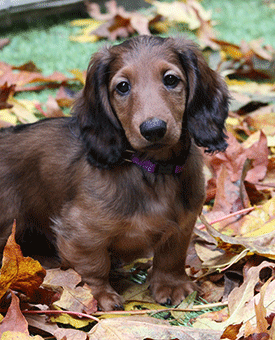 Here is video of Erik's first Puppy Track on 12 October. 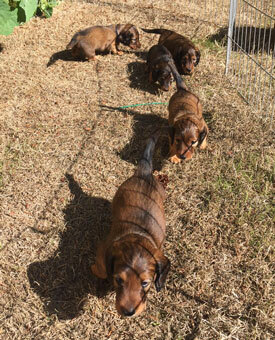 There is a large scent circle at the start with lots of treats and then a straight scent line with treats leading to the jackpot at the end. The Vikings are growing up fast, and are fast under foot as well. Before heading off for a week-long business trip, we took time for portraits and the weekly weigh in. 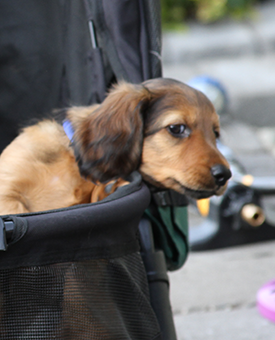 Every day this week the dogs are having new experiences, often moving about in their stroller. 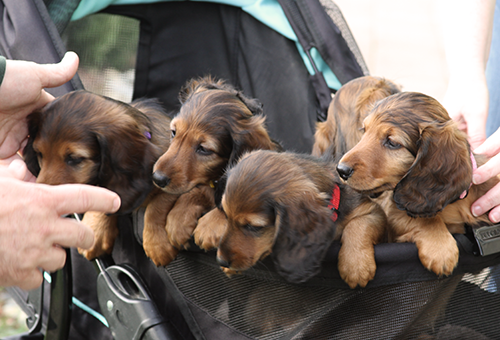 As you can see by the human hands, keeping them in the stroller has become a challenge. From left to right, you see Purple, Yellow, Red and Pink, with Blue behind Pink looking the other way. VIDEO: Watch this video of the Vikings playing in the dog run and seeing balls for the first time. Blue at seven weeks weighed in at an even 5 pounds. Maybe the Prince Valiant haircut will come back in style. Pink and her curly hair weighed 4 pounds 13 ounces. Red looking a little punk rock here, weighed in at 3 pounds 13 ounces. Our big boy Purple topped the charts once again at 5 pounds 4 ounces. He agrees the Prince Valiant look is stylish. Yellow inherited Bossa's racing stripe on his nose. This week he weighed 4 pounds 3 ounces. Blue managed to avoid being pictured in our stroller picture, so here is a candid of him from that session. Until next week, here's Pink posing in the yard. 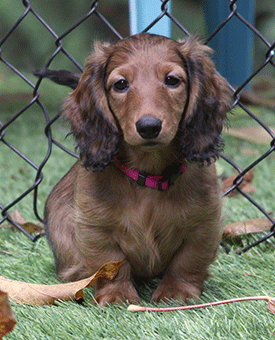 Pink will be getting her own web page here on the site soon - we've decided to keep her and call her Vinca. 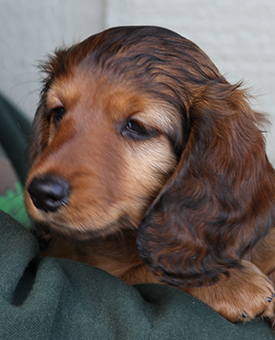 Then on Friday the puppies had their Volhard temperament test, one day before turning 7 weeks old. They all did very well, but Pink was the stand-out star, as you can see from the video of Pink's Volhard test. From the Puppy Party, here is Pink getting rewarded after pushing through the chute. 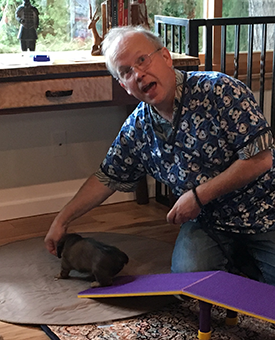 Here's John luring Purple across the mini-dogwalk. Yes, John, we saw that amazing performance by Purple. He really liked that obstacle. Bossa showing that jumping ability has value as she escapes from her pack. She won't be able to do that for long. The Vikings are now 5 weeks old and getting bigger and friskier all the time! 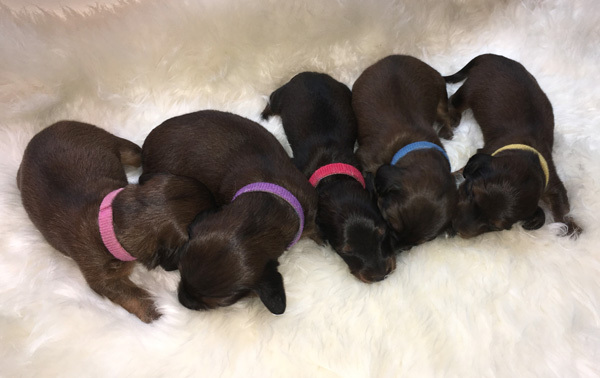 Red is still the smallest at 1090 grams, followed by Yellow (1240 g), Pink (1450 g), Blue (1600 g), and the biggest, Purple, at 1680 grams. Sadly, we usually forget our camera when we introduce them to new experiences. 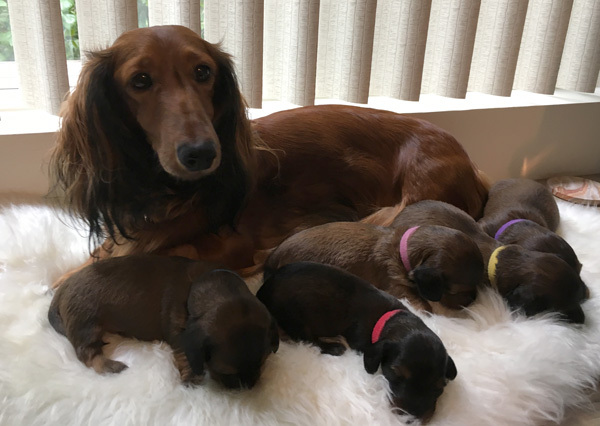 Here's video of all five playing the courtyard, along with Mom Bossa and Auntie Olive. And here's video of the Vikings doing Barrier Challenge II. 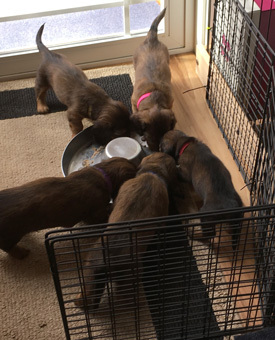 In Barrier Challenge I, we put them on the other side of a fence from their food bowl, and see if the puppy figures out how to go around. 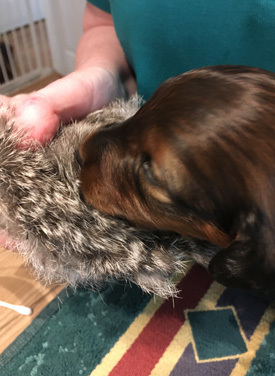 In Barrier Challenge II, we add a puppy already eating, to increase the arousal level. You'll see that Red has the most trouble with this. He actually was the fastest to figure it out the first time he saw Barrier Challenge I. Red (left) and Yellow after a play session in my office. 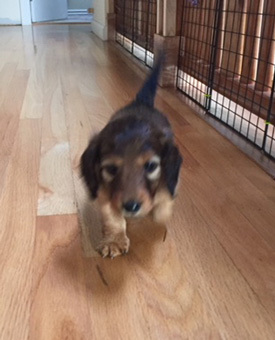 Pink goes racing down the hallway after escaping from the puppy play pen. Red with a fir branch from last night's wind storm. The Vikings enjoy breakfast after solving a barrier challenge. At 4 weeks old, the Vikings are in too much motion for a group photo! Every day they are bigger and more sturdy. At the beginning of the week, they were still toddling and falling over. But by the middle of the week, they are walking well and even starting to scamper. 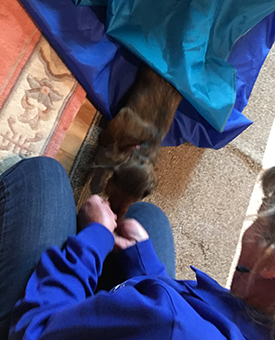 We have taken them outside for the first time and they are meeting new people. Here is a tiny bit of video of Yellow in the courtyard. The Vikings discover new lands during their first time in the backyard. And there are a lot of smells to discover too. 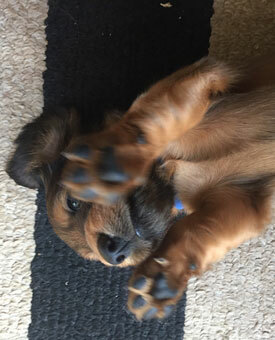 Blue rolling on his back. Pink taking her 4 week old photo. 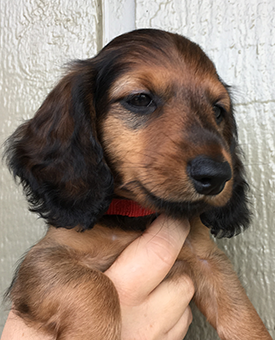 Red on his first journey on the courtyard deck. 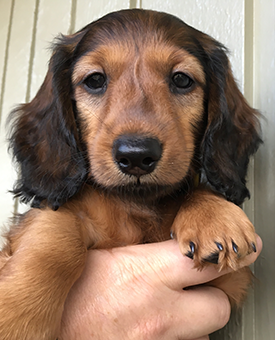 Potential puppy owner holding Red. Below is the Vikings group photo at 3 weeks old, on 9 September. Red (495 g) is half the size of Purple (1000 g), with the others between 770 and 930 g. They are all on their feet (but not very steady) and can see and hear. 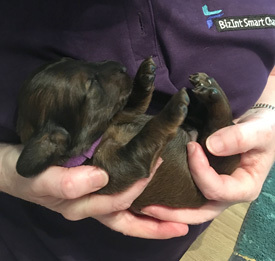 Purple male at 3 weeks. The big guy! 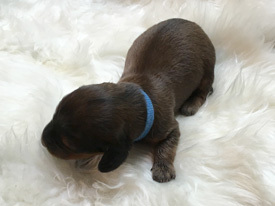 Blue male at 3 weeks. Very steady. 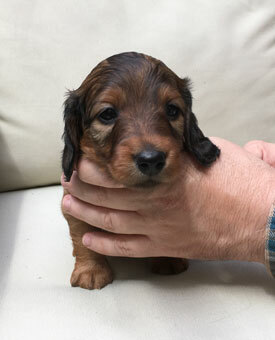 Red male at 3 weeks. Our little explorer! 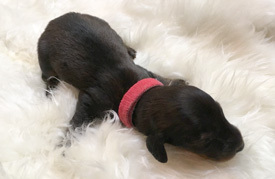 Pink female at 3 weeks. Always takes a cute photo. 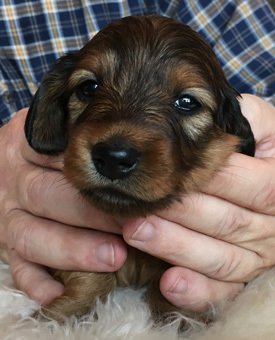 Yellow male at 3 weeks. A quiet guy. 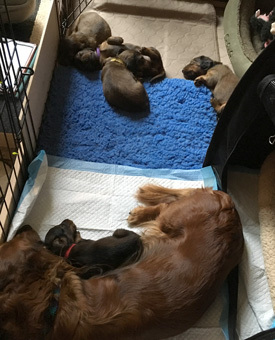 The Vikings moved this week from their whelping box in our master closet to their puppy pen in Diane's office. Here is Bossa with the Vikings on 1 September. And here is the Vikings 2 week old portrait, taken on 1 September. 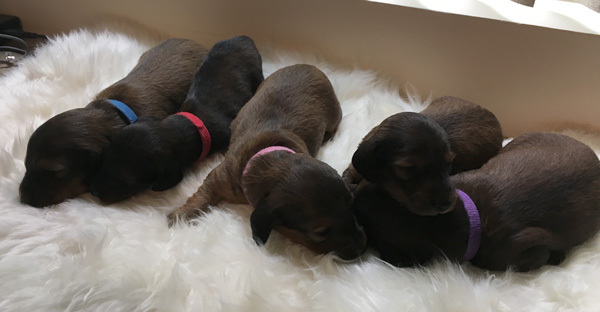 They have all doubled their birth weight, ranging between 385 g (Red) to 685 g (Purple). 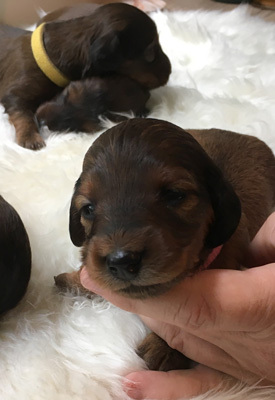 Pink's eyes are open and the others are starting to open their eyes. Rabbit fur is very popular for scent stimulation. On 2 September we introduced the Vikings to lapping goat's milk from a little dish. 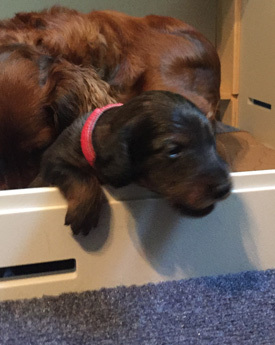 At right, Red is trying to climb out of the whelping box to get more! Here is Bossa with the Vikings on 24 August. 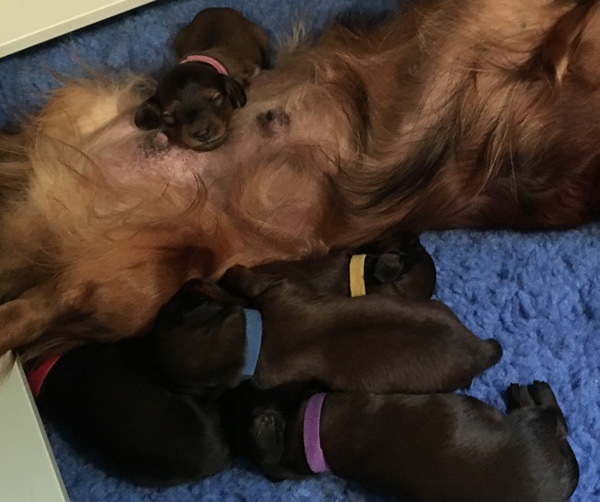 As of Day 10, Blue and Purple have doubled their birth weight, Pink is close at 185%, Yellow is at 165% and Red at 152%. And here is the Vikings 1 week old group photo, plus individual shots of Blue and Red. 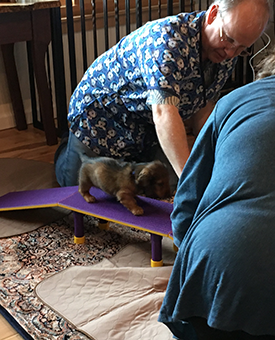 We're following Jane Killion's Puppy Culture socialization program and are doing the Carmen Battaglia Early Neurological Stimulation Exercises. Head held erect (left), scent stimulation (above) and supine position (below). That's Pink below right. 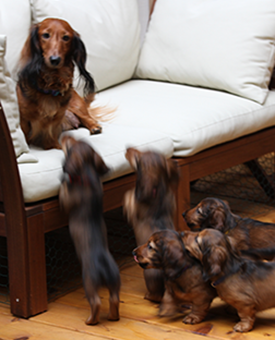 Here is Bossa with her pups after they came home. 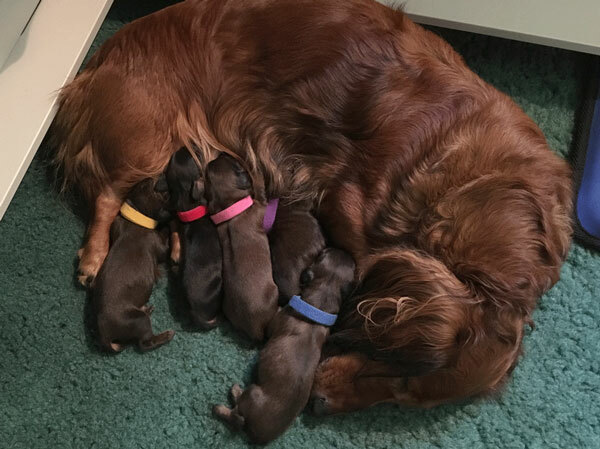 Blue and Purple are the biggest males, Pink is the female, and Yellow and Red are the smaller males. 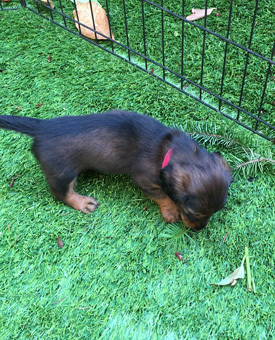 One of the most brazen explorers in the litter is the smallest guy, with the red collar. Here is is at weigh-in on day 2. Bossa is being a wonderful mom. Here Blue relaxes on her muzzle.